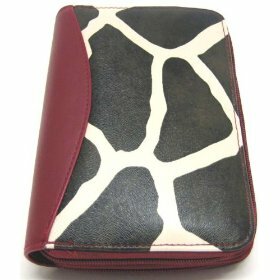 This beautiful giraffe print textured vinyl organizer / planner is the perfect carry all for today’s busy businesswoman. Giraffe print. The organizer has a 6 ring binder that holds refills from any office supply store. The included planner pages are not dated, so you won’t need refills for a year. The organizer has red vinyl trim on the binding. It makes a great gift for any woman in your life. We have a limited supply of these, so don’t miss out. Get yours now!